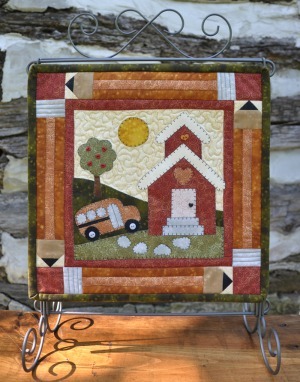 Yes, I know that this is a quilting blog, and, yes, I know that I have only written about quilts (or sewing) since the blog began. 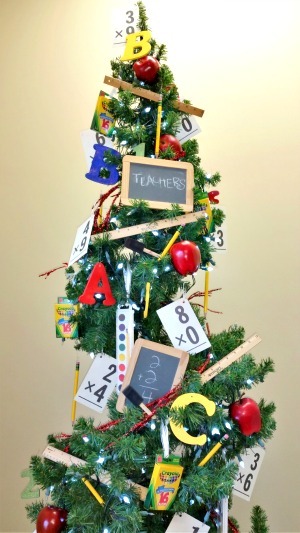 Today, however, in honor of all the children returning to school in a few weeks, I’m writing about a fun way to celebrate this occasion: a back-to-school tree. My family physician’s waiting room contains a Christmas tree, not just during Christmas time, but all year long, and the office manager changes the decorations on the tree according to the season. 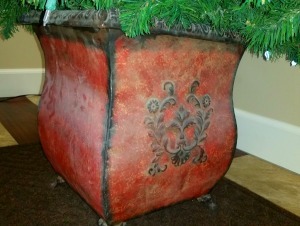 This tree is one of the first things you notice when you step in the door, and I always smile when I see it. It is cheery, with a capital CH, which, you must admit, is a nice thing for a doctor’s office. 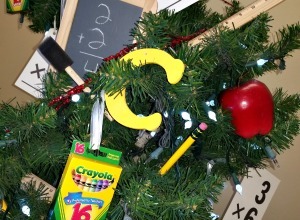 The fresh school supplies hanging on the tree—real items you might find during a back-to-school shopping trip—give the tree a lot of its charm. The photo below shows a new box of crayons, an unused paint brush, a ruler, pencil with a good eraser, and flash cards. Here are close-ups of the small chalkboards. 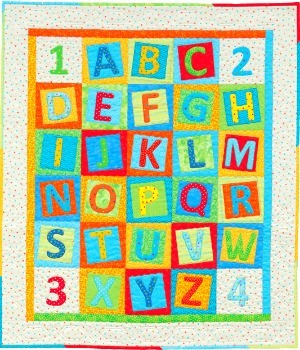 Notice that the alphabet letters are painted in the primary colors: red, yellow, and blue. And I love the pop of color from the red apples. I once asked the doc why he chose to decorate his office with a Christmas tree. “I got tired of carrying it up the stairs from storage in the basement,” he said. “It came up at the end of November and then down at the end of December. And you can’t haul a Christmas tree upstairs without also bringing boxes of decorations. But worst of all, we anchor the tree in a metal pot full of gravel, so I got really tired of carrying 50 pounds of rocks.” I reminded him that beauty is sometimes painful—ask anyone who’s ever had her legs waxed—and that the beautiful pot was totally worth the effort it cost him to bring it upstairs. He was not convinced. 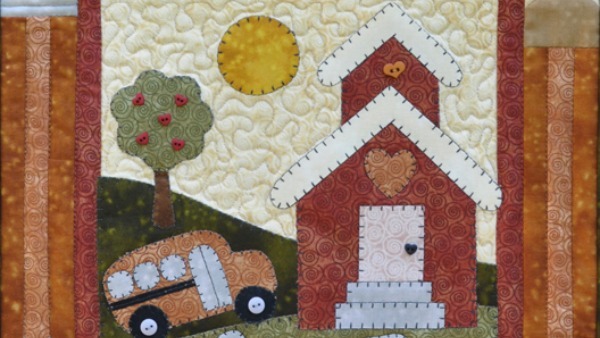 And below are some back-to-school quilts to go along with a back-to-school tree. The one below is from TheWoodenBear.com. I love the pencils in the border. This one is from BookRiot.com. 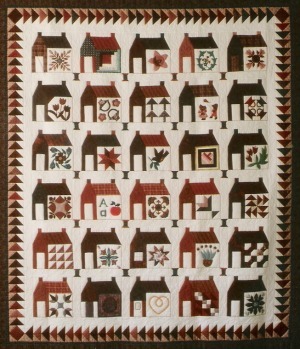 Here is a schoolhouse quilt from Kingston Heirloom Quilters at QuiltsKingston.com. Notice the unique and beautiful details inside of each house block. 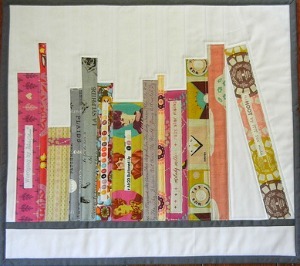 And finally, here is an ABC quilt from the book, Cuddle Me Quick – 11 Baby-Quilt Designs at ShopMartingale.com. 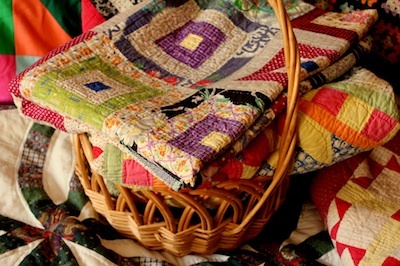 Yes, it’s a baby quilt, but wouldn’t it look fun made from primary colors and hung in the doctor’s waiting room on the wall by the back-to-school tree? 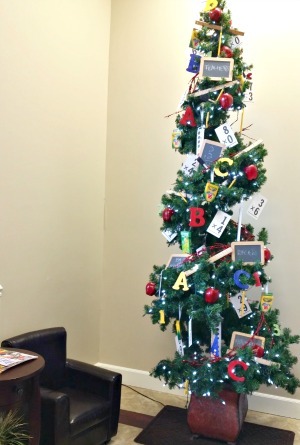 The McAdenville branch of Truliant Credit Union has a tree in their lobby and it is decorated according to the current season. Cheerful and welcoming. The doctor is doing a good thing! Such a super nice idea. I like that.